Fender recently set about recreating Kurt’s guitar to the ding in their custom shop and rolling the product out on the 20th anniversary of Nirvana’s seminal and billboard-busting album, “Nevermind.” I admit, at first, I thought this idea was pretty lame and the antithesis of what Punk Rock preaches (if it indeed, as a movement, preaches anything at all). Why would anyone pay a cool grand and a few hundred dollars in change for a guitar that looks like it’s been beat to hell and back? Punk Rockers are supposed to beat their own guitars to hell and back; that’s the whole idea of DIY. This manufactured good, this product, this exploitation – as some might view it – lead me to the subject of creativity. I wasn’t sure what I was looking for, perhaps I would never find it – perhaps no guitar could live up to a myth. I ended up putting the guitar aside for a number of years and took up the drums (I was, frankly, sick of the lack of discipline and general mediocrity of the succession of drummers we employed in my band, so I decided to learn how to play the drums myself). It was a great decision; I was a much better drummer than guitarist. Kurt Cobain was known to say he was a frustrated drummer – he pined for the adoration of John Lennon, but wished for the anonymity of Ringo Starr. However, the love of the guitar still had its hold on me. As it turns out, once this instrument gets you in its grasp, it never lets go. So, when the 20th anniversary of Nirvana’s breakthrough album passed by, and the sounds of Nirvana and their distorted instrumentations came whooshing back into my brain, so did the image of this guitar: the image presented by Fender’s replication of it. Why did it take them this long to catch on? Or perhaps I was just stuck in the past and I hadn’t moved on. Or, the converse, the world hadn’t quite caught up to me and my predilections. Until now. 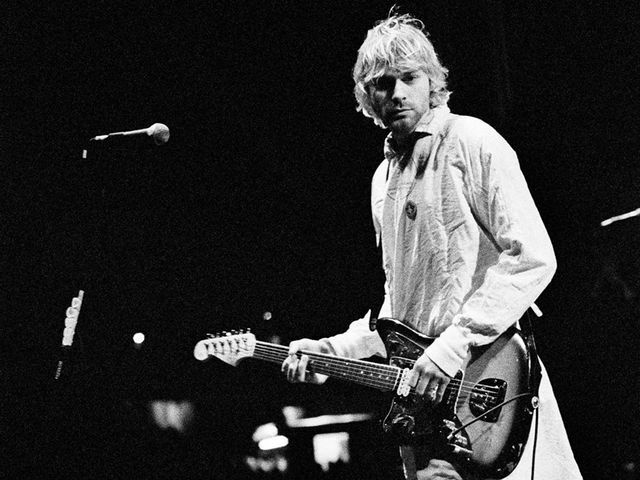 The beautiful thing about Kurt’s guitar is its timelessness. First of all, it was a 60’s guitar that he used in the 90’s, and now it was being sold again, the way Kurt’s looked and sounded, in 2012. This guitar was “steampunk” before the term became recognizable by the mainstream of pop culture (incidentally, the term was originated around the very same time Nirvana originated as a band – it just didn’t become fashionable until recent years). It’s classic in its sunburst, surf-guitar sense, but sci-fi in its overwhelming use of shiny metal, moving parts and knurled knobs. It even has a 50’s Fender “spaghetti” logo that Fender claims was never used on a Jaguar, that its use on this specific guitar is a complete mystery. How did it get there? And it was apparently there when Cobain bought it. It had mods that seemed to incorporate genuine Fender hardware, but again, there’s no record of a guitar like this ever being officially produced. Cobain’s guitar tech, Earnie Bailey, seems to imply that Kurt liked to use cheap pawnshop guitars to protest against the obsession with gear that the guitarists of 80’s hairbands preoccupied themselves with. If they had an obsession with effects pedals, Floyd Rose Tremelos and glittering guitar straps, Kurt had obsession with breaking that obsession to pieces (literally by breaking his guitar, and sometimes his amplifiers, to pieces at the conclusion of his shows). But, the exception was this particular Jaguar. Perhaps when Kurt bought it for $300 at some podunk shop in LA, he had intended to destroy it right along with his other guitars. But something happened – something must have indeed happened, because he never did break it. He babied it, in fact. Some kind of biological fail-safe had kicked in. There was something special about this guitar. He couldn’t kill it; it wouldn’t let him. It no doubt had its hold on him. It had the stink of buying a jacket in the department store that has safety pins integrated into the garment as a means of conveying a “punk rock” aesthetic; when, in all likelihood, the origins of safety pins in one’s clothes arose from the need to keep an article of clothing together while it was falling apart and the owner could not afford to replace it. It had the stink of punk rock by JC Penney. Same goes for brand new clothes with patches already affixed to the pre-ripped knees of jeans – the gall of some brands charging over $100 for such thing (and don’t get me started on paint-splattered dungarees). This was, and still is, the guitar of my dreams. It is arguably the reason I picked up a guitar in the first place. I had a Jag-Stang, which was also a knockoff of a presumed original, so the way I looked at it was that I might as well sell this one and procure the better knockoff. There was something in me that still had to have this guitar. Even after selling the Jag-Stang, which itself has become a rare piece of equipment, the Jaguar was unfortunately still a bit out of my price range. However, it occurred to me, what better guitar to buy used? No one in his or her right mind can tell if it’s been used or not: it was made to look like it’s been used since 1960. So I bought a used one, which was apparently in “mint” condition, whatever that means with respect to this instrument. What normally would turn off a guitar buyer, namely cracks, blemishes and earwax in its electronics, turned me on immensely. There was part of me that wanted to pick up where Kurt left off back in 1994, when I held a guitar in my hands for the first time. I had begun my music-playing career by learning Nirvana songs (technically, they’re some of the easiest songs to learn and make for great material for the beginner guitarist) and my musicianship evolved from there. I had put the guitar down for a long time, replaced it with drums, and as I hold this guitar now I am back to square one, back to the place that got me interested in the limitless sky of the sonic world. It is already marked, marked by the man who so indelibly marked me. And just as I had once thought, delusionally so, that I might assume the mantle and run with the torch of grunge to the top of the charts, I’m now left with the guitar that started it all, alone in my living room, hooked up to my Orange practice amp and RAT distortion pedal, strumming the opening chords to “Lithium,” the first song I ever learned to play on guitar. But this time I’m not concerned with form, with style, with copying others before me – I’m letting the pick scrape against the pickguard, I’m nicking the headstock against the wall, I’m making the established buckle rash worse with my own belt. I’ve bought a used guitar, a guitar that was used by my idol, which I plan to use and play just as hard, so that I may at some point later in life pass it down to someone else who will then be able to subtract the wear and tear he receives it with from Kurt Cobain’s wear, and be able to see the face of me marked into it. As one of the characters, Megan, says in my book, “Nothing’s ‘original’ anymore. I mean, think about it. Everything gets recycled. But, I guess, really, it’s what you recycle it into that matters.” It’s not about creating something new; it’s about using what resources are available to you and putting your stamp on it. The idea, the lyric, the melody is always the same, but it’s the way you present it, write it, and sing or play it, that is what makes it unique. We are all influenced by others, whether we admit to it or not, that’s human nature. However, it’s only when you are able to acknowledge that influence as a tool, and not an end in itself, that you are able to climb to the next level of creativity. Don’t ever forget your influences, because they are what we need to recognize our ability and take the next step – they are the ground upon which our creativity walks. Just be sure not to stand too long in one place, because the ground is always changing, and we got to keep on moving. The “idea” is always the same, but what is 100% unique is the way your eyes, and ears, see, and hear, it. It’s your personal perspective, your angle, of the idea that you must strive to share with the world. It doesn’t matter if you’re generating that idea via the replica of Kurt Cobain’s guitar, or via a guitar that you built yourself, it’s the sound waves you generate from it that matters. If it’s the former, there will likely be some punk with safety pins in his jacket criticizing you for the lameness of your tool. But the kind of person to make that the primary source of his criticism, and not the execution of the idea – in this case the music its producing – is probably the kind of person who stuck those safety pins in his jacket not because it was falling part. The nature of creativity lies in the making of something old into something new by making it your own. Mustangs play like butter. Very nice guitars. 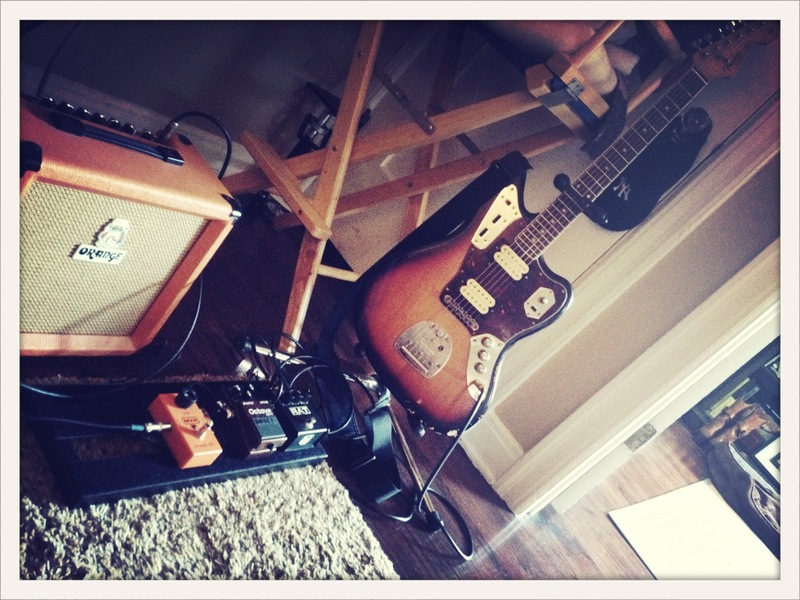 I just purchased a Squier Bullet Mustang HH at a Tom Lee Music in Vancouver for $199 cdn; when I plugged it into my rig (BOSS TU-3 -> EHX Stereo Poly Chorus vintage reissue -> BOSS DS-1 -> EHX Big Muff Pi -> Tech21 SansAmp Tri AC -> Yorkville 4020AP PA amplifier) the humbuckers in parallel position sound exactly like the Cobain Jaguar guitar. Clean or dirty, the tone and build of this, for Squier, are impressive. Amazing craftsmanship by Fender in all departments as of late to pay such an homage to one of the greats. I just purchased the NOS version of this guitar and the only difference was that I wanted the same ‘opportunity’ of the instrument itself and what it could do, but forge my own history into it’s shiny newness and hopefully have it look more worn with my own history when I can no longer play it. I had a guitar, my first ‘real’ guitar that pulled things out of me I never imagined. It was modded, making a one off, and I do actually play left handed. It was stolen. I convinced myself that it’s nicer, more expensive replacement was a better guitar. On paper it was. In my fingers though and in my imagination, I never could acknowledge that I lost more than the guitar when it was stolen. I think fondly of the feelings that at times overwhelmed me when I first got that guitar. I chalked up the loss of that feeling to “it was because playing guitar was new back then”. Turns out, it was a special guitar that compelled me. I finally found another guitar that is doing the same… and maybe more, since I can play far better than I could back then. New ideas, sounds, energy is just flowing out of me every time I sit with it. I enjoyed your article a lot. FYI, I think the post above mine is spam, found on a lot of forum sites, posted by post-bots. I love your thoughts on this. I’m sorry your guitar was stolen. But the memories last. Had to laugh to myself about the safety pins. That’s awesome. I’m glad you liked it.